The Classic Army Nemesis series of AEGs was designed to give players at all levels the ultimate tool to take down the opposition. Classic Army took the best parts of its battle-tested Scarab line and incorporated them into your enemies' worst nightmare. The UX7 gives you the comfort of a smooth modular rail, but you also get the easy accessibility of the Picatinny rail sections included in the box. That makes the Classic Army Elite Nemesis UX7 Carbine AEG Airsoft Gun perfect for customization and close-quarters to mid-range engagements. It all adds up to amazing versatility, great value and total dominance in a range of situations and environments. Externally, the upper and lower receivers are CNC aluminum. That gives you a super-aggressive billet style look that will make your adversaries quake in their boots before you even open fire. This clever design also ensures both receivers match up perfectly. The careful thinking that went into this gun extends even to details like the handguard, which was custom designed in-house by members of Classic Army USA. 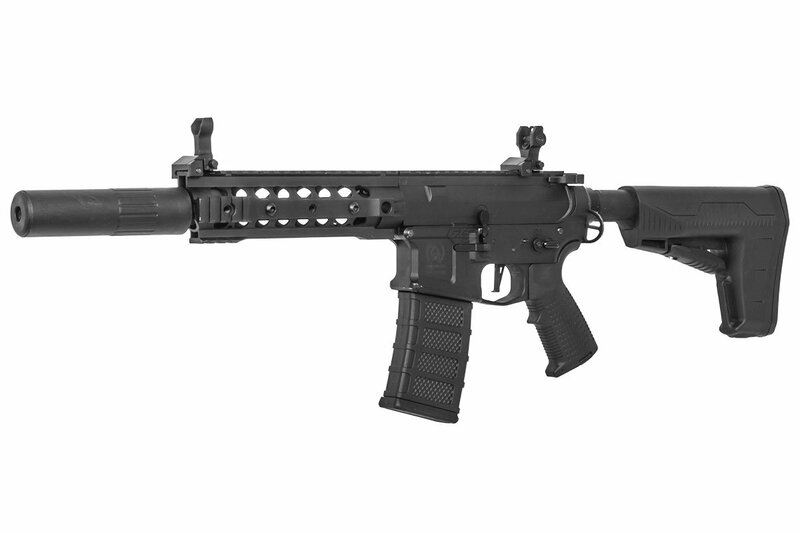 Give this beautiful carbine a once-over and toward the back, you will notice a three-position PDW-style stock. Internally, the gun has a 9mm bearing bushing gearbox, a brand-new electronic control system, or ECS, 6.03mm tight-bore barrel and a TRUE quick-change spring system. The ECS not only protects your trigger contacts. 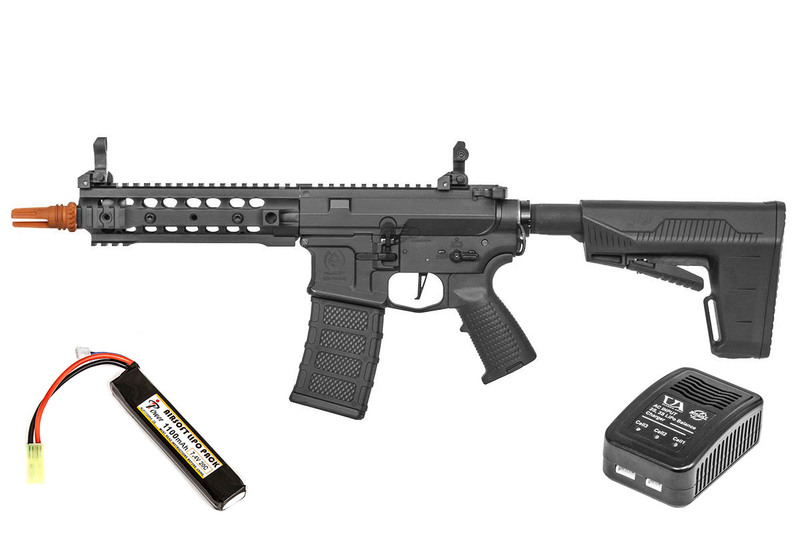 It also has a trigger-programmable three- or five-round burst-fire function. It will shoot 375-400 fps using 0.20g BBs and 900-1000 rpm using a 7.4V battery. It has a true quick-change spring system you can access without having to take out the gear box, so you can quickly and easily upgrade or downgrade your spring to change the power level. Wondering about this carbine's performance in the heat of the battle? Here's an experienced player's field report: The Classic Army Nemesis UX7 excels at fast-paced play. While it is a very versatile gun capable of handling a multitude of roles, what makes this gun a standout performer is its ability to quickly maneuver due to its lightweight design. It engages targets at almost any distance on the airsoft field with its long, tight-bore barrel. In CQB, this gun can also be handy, as its ECS unit gives it awesome trigger response when paired with the included high-torque motor. The UX7 utilizes a futuristic and aesthetically pleasing angular design that makes it structurally sound but also very light. As you attach accessories such as lasers, flashlights and vertical grips, you'll find that it's not going to get as heavy as other guns of a similar size. The very thin sleek lines on this gun beg to have a mock suppressor attached to the muzzle, and its 14mm CCW threading means most aftermarket options will fit as well. A variable magnification scope is the ideal topper to this package, providing you with versatility to match the gun. A short dot-style optic will be best for this purpose, allowing you to make use of close-range and some mid-range magnification to spot your enemies before they spot you. The UX7 is the perfect choice for guerilla MILSIM gameplay, allowing you to sneak in with its compact lightweight form factor and then hit at range with its lengthy barrel and high-quality tight-bore inner barrel. Once you've got the drop on the enemy, its sleek profile allows you to slink away unnoticed, quickly reposition and keep hitting the enemy while they frantically search for you everywhere but where you're engaging from. Does this rifâ€™ come with the mock suppressor in the first picture? Does this gun come with the classic army 25k motor or the upgraded 31k motor?